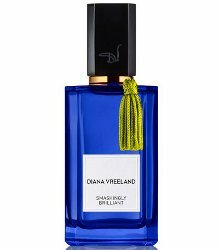 The Diana Vreeland line has launched their sixth fragrance, Smashingly Brilliant. The brand debuted last year with five fragrances (Simply Divine, Perfectly Marvelous, Outrageously Vibrant, Absolutely Vital and Extravagance Russe). Smashingly Brilliant, created by [perfumer] Clement Gavarry, was inspired by Mrs. Vreeland's love for the island of Capri. A play on contrasts, the fragrance combines the zesty freshness of citrus notes with a deep textured background. The burst of Lemon Oil and Calabrian Bergamot Oil is enhanced with aromatic notes of verbena, basil, and juniper berries. A luxurious heart of Geranium Lemon Living creates a bridge to the sensual dry down of suede accord and enveloping woods, offering a trail of mysterious depth and raw elegance. Diana Vreeland Smashingly Brilliant is available now at Neiman Marcus, in 100 ml Eau de Parfum, $250. I’d never even heard of this line and I have to assume that the scents are the usual rubbish that everyone is cranking out these days, but the names for them (and the prices!) are certainly in line with Diana Vreeland: I’m reading her autobiography, DV, and she is the most preposterous woman — accomplished and talented, self-involved and ridiculous. I’m reading the book one chapter at a time with a break in between because to try to read it in one sitting would be like eating an entire croquembouche. Kevin talked me into watching a documentary (forget the name now) and it was fascinating. These were done by her grandson. From what I hear, they’re generally underwhelming. DV is one of my favorite autobiographies. She was a pip! The names are silly but I remember liking that jasmine one. Not bad. I would like to sniff more from this line…though, the notes of this one don’t sound up my alley. I like the color, but not really tempted to go look for it. I liked the jasmine one best too (sniffed them all when they came out). It was a pretty but fairly straightforward jasmine. I received a Nieman’s catalog today and this fragrance sample was in there. To my surprise this smells so fresh and crisp. I love it even though it is expensive.